There are – scattered all over the world – experienced students of theosophy who have dedicated their whole lives to the search for truth. Many of them are of the opinion that the future of the theosophical movement does not depend on superficial issues like propaganda, money, or political power. It depends, they think, on the silent, long-standing effort of those who study and gather evidence on the process of lay discipleship in classical literature, and who try to live like the disciples of Divine Wisdom do, then producing their own practical evidence on this matter. They were called “The Few” by Helena P. Blavatsky. It was to them that she created in 1888 an esoteric school, whose only recognized temple should be in the heart of every sincere truth-seeker. The theosophical effort (and mission) points to the future of humanity. And it does not aim at having a great quantity of believers or followers. It concerns itself instead with the quality of its pedagogical work, with the level of accuracy in its research, and the amount of impersonal altruism present in the actions performed by its students. The “Few” make the difference, and the reason for this is that only operations done on higher levels of consciousness, and operations that are consistent with such levels, can resist time and produce real effects in human karma. The task is not to enroll multitudes in some religious corporation, but to have the few who know what they are doing to help the multitudes along the brotherly way to self-knowledge, self-respect and self-responsibility. Along such a path, whitewashing human illusions is worse than useless. One must work at the level of an imperfect but effective combination of Buddhi (the light of our immortal soul) and Manas, or Mind. The real effort occurs under the Buddhic light, which emanates from Atma, one’s highest level of consciousness. Only actions that are in harmony with the Universal Law really count. This is the secret of the permanently healing influence that some classical works belonging to ancient Eastern and Western literature have over human mind. The secret and often unperceived existence of the higher levels of consciousness is also the reason why the works of H.P. Blavatsky get more influential as time passes. A fundamental step for students of classical philosophy is therefore to examine the levels of consciousness where they now mainly live and operate, and to see how enduring are actions taken on these levels. The Causes of both suffering and happiness are on the subtle realms of life. Theosophy teaches its students how to work so as to eliminate the Cause of that human suffering that is now already unnecessary; and to set the causes in motion that will provoke one’s inner liberation from selfishness and from ignorance. The “Golden Stairs” make a shining, unique fragment of theosophical literature consisting of a few lines present in one of the Instructions that Helena Blavatsky wrote to the members of her Esoteric School. The fragment gathers together fourteen steps that – as some students think – sum up the whole path in a few words. These ideas are inseparable from one another. One can’t practice one of them in a proper way without practicing the others. Their interaction must be understood. There is no pre-established sequential order among them. Any step can be the first one to us, or the second, according to our temperament, karma and circumstances. Let’s then calmly examine each step. Any idea of a clean life implies the theoretical possibility of having at some point an unclean existence. What are the impurities or mistakes one should avoid in order to have a clean life? Outwardly impurities may be legion. From an occult or essential point of view, they are all of the nature of selfishness, and selfishness emanates from ignorance. A clean life is the life you start each morning as you wake up and decide to dedicate the day to a noble cause, and to right living. A clean life does not depend so much on “doing” something that is noble. It depends above all on “aiming” at something altruistic and which will have lasting beneficial effects. How can one express that in practical terms? It is simple: where there is a noble will, there will be a noble path, and it will show itself in due time. There is a profound difference between having an open mind – the second step in the Golden Stairs – and accepting whatever is said to us. Credulity is the opposite of open-mindedness. Openness to new and different ideas requires a critical examination, discernment, good-will and a willingness to learn. This always comes to us for a price. Challenging, uncomfortable events are necessary to destroy routine. They invite us to consider facts from new angles and from viewpoints which we used to ignore. An open mind is an attribute of the individual who knows that life is about learning, about self-renewal, and about self-responsibility. Purity of heart is the third step. The heart is not separated from life, or from the mind. However, a pure heart includes detachment, for real unity must respect freedom. Detachment is possible when one can feel the fact that life is an unlimited, unified field, and that it both includes and transcends our universe. We then realize we have never anything to lose, if we look at life from a wider perspective: for all that which we deserve, be it pleasant or not, will be with us all the time – at least in spirit and in one’s subtle atmosphere – or it will come back to us in due time. The deeper layers of one’s heart are brave and do not crave this or that isolated goal. Personal desire uses to be the main source of fear. The heart in human beings corresponds to the sun in our solar system. The septenary energy of the Sun is everywhere on each of our planets, just as the septenary energy of the Heart is everywhere in one’s physical body, in one’s emotions, thoughts, and actions. A knowledge about the relationship between one’s heart and the Sun – the microcosm and the macrocosm – is the key to understanding the unity of life. Dictionaries say that “eager” means “impatiently desirous” of something; anxious or avid for something; characterized by, or feeling expectancy and great desire. An eager intellect is of the nature of Fire. It relates to an intense and questioning intelligence which puts truth above personal comfort. Someone who has a clean life, an open mind and a pure heart desires to know the facts about human existence. An eager intellect is buddhi-manasic. Its energy comes from the soul. It responds to the impulses whose origin is in the immortal soul. Its spiritual consciousness is blind to the illusions of separativeness, but has a critical view of life and provokes changes. Such an individual desires peace and wisdom to others more than to himself. An eager intellect relates to Compassion. The individual who has an eager intellect may have to radically innovate culture and karma around him, and fight injustice. H.P. Blavatsky, Pythagoras, Confucius, G. Bruno, M. K. Gandhi, Albert Einstein and others have done so for the last 2,500 years and more. The mysticisms which deny the importance of the intellect or label reason as “anti-spiritual” are often under the influence of power structures that can’t resist a critical examination. An open mind needs an eager intellect to search for the essential truth in each field of knowledge. From this, a discernment is developed that allows one to identify himself with that which is essential and choose it, while leaving aside whatever is unimportant or harmful to life. Thus one’s heart remains pure. A theosophical view of the world does not deny any of its dimensions. With it the truth-seeker transcends all isolated factors after having understood the mystery of life’s unity and learned other necessary lessons. One central factor in having a spiritual perception is in our motives. The will organizes one’s view of life. An unveiled perception is the result of dedicating one’s life to noble goals, with detachment as to any outer forms. Complicity, however, is no brotherhood. Accomplices are not brothers. They may disguise as brotherhood – even to themselves – the selfish nature of their association. Such a trick does not change the facts, or the karma. Altruistic brotherliness is the goal. It constitutes a core lesson in philosophy, and it brings about probation. Human relationships cannot be taken for granted: they occur under the karmic fire of a continuous testing. To be brotherly is our duty: it gives us no right to expect something from others. The truth-seeker must be a pioneer. In the first half of the 21st century, those who search for truth are not legion. It is the Few who make the difference: they transform the karma of our mankind by challenging Organized Ignorance and opening its way ahead. The phrase “a brotherliness for one’s co-disciple” is a reference to the ever creative process of communion and mutual help among the Few. Mutual help among co-disciples is the natural result of the fact that students have a common goal. Yet to give and receive instruction is not always easy and simple. The best way to help a colleague along the path – and everyone is potentially a colleague – is to listen to him and to pose the right questions, helping him express and organize his own feelings and ideas. The practice of thoroughly listening to people requires the silencing of one’s chattering to oneself. The ability to give and receive advice and instruction relates to meditational states of mind and soul, and implies detachment. The willingness to listen to the other in depth is important if we want to receive help. Yet there is a paradox: in order to listen to another, one has to know how to listen to the silent voice of his own soul, too. No one should be told “what to think” or “what to do”. People can be helped in thinking by themselves and in acting according to their own judgment. The goal is not a “perfect action”. The individual should aim at an action that is strongly connected to his conscience. Once this is granted, he will be able to learn from his mistakes. Mutual help must preserve independence: how to learn lessons from life is an art in itself. An aspiration for the higher, an ability to identify opportunities, and the possibility to make the right choices; these are three blessings in disguise, and they accompany us all along life. The “Teacher” is life itself, or one can say that He speaks through all events of life. To personalize a teacher is to have no real Teacher. In theosophy, the lessons flow above the level of words. The sentences said or written are but the outer vehicles and tools of the teaching. Real Masters, and co-disciples, operate on a more silent level. In practical terms, the Teacher is one’s own higher self. To It we owe respect. It is our duty to listen to “It”, and to act accordingly. The higher self or immortal soul becomes itself a proper disciple of a Master of the Wisdom if, and as long as, we are loyal disciples to the Inner Teacher who speaks through the silent voice of our conscience. One’s duty to the teacher includes a feeling of gratitude for all the great sages who have helped humanity since time immemorial. Each student of philosophy owes much to the great souls known as Pythagoras, Krishna, Patanjali, Confucius, Buddha, Shankara – and to thousands of Enlightened Beings whose teachings and work have made our humanity possible and rendered our present learning easier. Discernment, self-responsibility and gratitude to one’s Teachers constitute three central qualifications in the search for universal wisdom. “Behests” are authoritative commands. The voice of inner duty and truth sounds like the advice of a respected teacher in the consciousness of some truth-seekers. Others, however, are still prisoners to various orders of family and social duties and lower self habits. Such “duties” are then used as subconscious excuses for their personal attachment to unnecessary habits at the mental, emotional and physical levels. Between the behests of truth we listen to, and the average contents of our actions, there are various thick layers of Habit and Routine. A strong will helps destroying the walls of ignorance that prevent the Soul from fully awakening. The spiritual will emerges as soon as one firmly looks at the Goal ahead and has confidence in the Teacher. And the teacher is one’s own innermost, highest Self. The illusory character of minor factors in one’s life then gets clear. Our personal motives get rootless; we find rest only in the perception of universal reality, for it is eternal and in it we truly live. As that happens, our lower self becomes a warrior. It seeks for no comfort, and remains loyal to the voice of the silence and to the behests of truth, to which it listens in the upper territory of inner bliss. In philosophy, all thoughts and feelings of personal nature must be watched from the point of view of one’s highest potentialities. The lower level of human life is probationary. It must not be taken too seriously except as a source of lessons. In its slippery field, justice, or equity, is the main goal. Inner strength results from courageously facing personal hardship. The feeling that we are unjustly attacked creates an occasion to observe the process of selfish emotional self-defence within oneself. Selfish mechanisms are the illusions of ignorance. They cause tidal movements in our inner world; they are not ourselves, in any way. We are the observers. We are much wider than any particular movement or state of mind in our souls. Our own good actions are more important than injustices we may suffer. The correct thing to do is to concentrate in right action, and persevere. Personal injustice against us is mayavic, or illusory, as many an event taking place on a personal level. One may have to defend oneself at times. One must also observe his own actions and see which of them are right, which are wrong. One can decide again and again to improve them all, within our possibilities. From the moment you act on philosophical and ethical principles, and not out of selfishness, your logic is different from the logic of the world; you must make your principles visible, so that your actions can be understood. Such a declaration of principles must be brave because philosophical and theosophical principles are secretly – and sometimes openly – “heretic” in a society vastly dominated by short term considerations, personal desire and egotistical impulses. The fact that these blind motives often are disguised and presented as spiritual makes one’s testimony even more necessary, and in some cases hard to understand. Silence and declaration of principles can be combined. Wordless action is an eloquent form of speech and a truthful way to express oneself and one’s philosophy. The brave declaration of principles must express what we live already – even if imperfectly – and not what we once read about and adopted in words only. It is the natural result of a clean life, an open mind and a pure heart, among other factors. There can be no real merit in philosophy without a sense of justice and an active solidarity regarding those who are irresponsibly attacked. Brotherhood includes more than just taking tea with biscuits. While tea is often welcome in theosophical meetings, it cannot eliminate the need for ethics. The theosophical effort can only live under tests and probations. If there would be no tests, it would not be alive. As a result, one must beware of too much tranquility. The phrase “a valiant defence of those who are unjustly attacked” means that the defence should not be blind. An impartial equilibrium and discernment are necessary. Once it has been calmly determined that an attack is unfair, a willing sacrifice is the option and compassionate action must follow. It is not our duty to defend ourselves: one must defend others. Justice, truthfulness and self-sacrifice are among the main foundations in a brotherly association. In theosophy, the three of them are exerted with strong determination and under a karmic fire which provokes alchemical changes. Sharing tea and biscuits is good: it must express a profound feeling of communion and mutual help. Looking at an Ideal is of course not enough. Seeing mistakes is important, and discernment between right and wrong, essential. However, this can be only done if one has a clear and divine goal from whose point of view to look at life. In order to be effective regarding any particular issues in one’s existence, one must have a healthy vision of the future. We can only act in a correct way if we have a clear view of the goal ahead. A constant eye to the ideal of human perfection enables students to be guided by the perception of a distant and luminous future. The times to come are present and alive right now in the form of occult potentialities; they radiate an influence that can be seen and felt. And one can expand the knowledge about essential aspects of the past and the future through the study of the law of cycles. Past, Present and Future are three aspects of the same sacred Wheel of Time. The present moment is the Open Page where one writes down his future with his own actions. One must know what to write. The contents of such a scripture are given by the view of the future goal, the ideal of human perfection. The fourteenth step of the Golden Stairs of esoteric philosophy closes the fragment by mentioning the Temple of Wisdom, which is located mainly in one’s own heart and conscience. 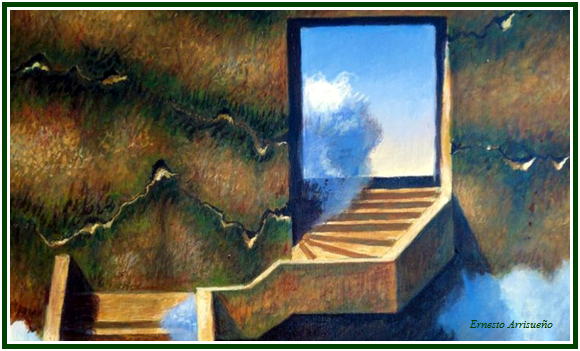 The image of the climbing of stairs symbolizes the transference of the consciousness’ focus from the lower self to the immortal soul. “Don’t you know that you yourselves are temples?”, asks 1 Corinthians, 3:16. And indeed, the theosophical path exists along Jacob’s Ladder (Genesis), or Antahkarana. Such is the Golden Stairs or bridge that connects the terrestrial consciousness to the divine and celestial awareness, in our own soul. The “Collected Writings”, Helena P. Blavatsky, TPH, volume XII, p. 503. See the article “All Life Is Good”, by Carlos Cardoso Aveline. It is available at our associated websites. On the topic of brotherliness among co-disciples, see the texts “Learning From Each and Every Event”, by Helena P. Blavatsky, and “One for All, and All for One”, by Carlos Cardoso Aveline. Both articles can be found at our associated websites. “Letters from the Masters of the Wisdom”, Letter II to L. C. Holloway, First Series, TPH, 1973, p. 150. The above text was first published by “The Aquarian Theosophist” in its edition of November 2013.